It’s been another interesting weekend in Siberia. 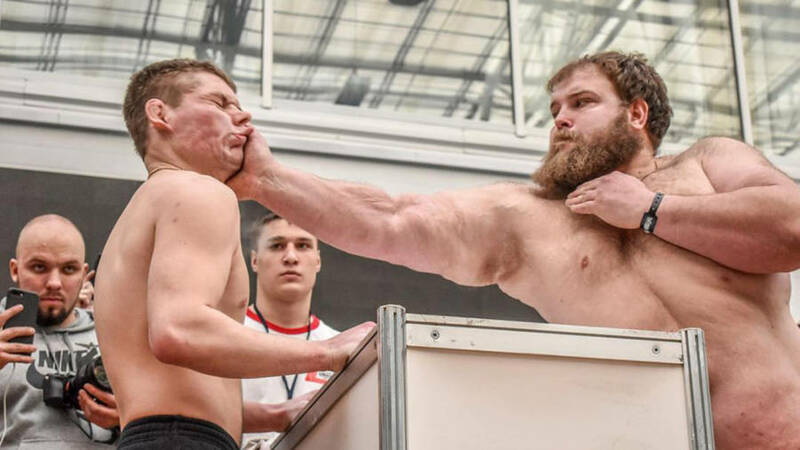 This year, the first ever Male Slapping Championship came to Krasnoyarsk, Russia, where the annual Siberian Power Show (SPS) took place. 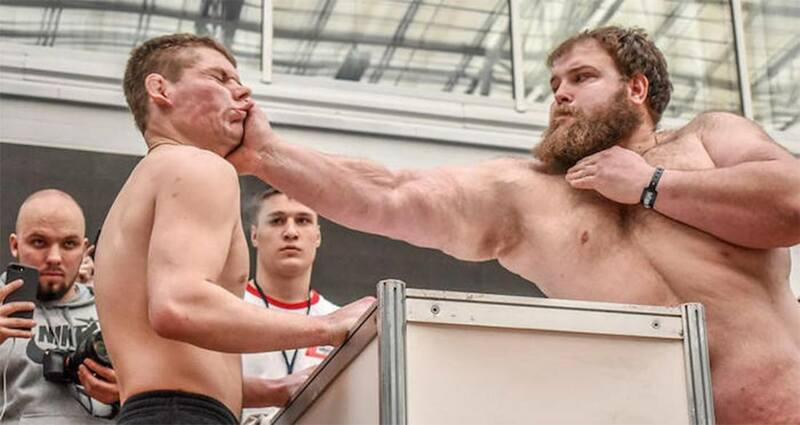 As the name suggests, the slapping competition is just what you would expect it to be: Russian men slapping each other in the name of athleticism. Rules of the slapping competition appear to be pretty simple. Both slappers stand face-to-face, separated only by a small standing table that is wedged in between them. The slappers are allowed a few minutes to prepare by dusting their palms with white powder and strengthening their stance in order to better withstand the blows of their opponent. Once the fight starts, the contenders take turns slapping each other until the referee calls an end to the competition. Neither slapper is allowed to dodge or avoid their opponent’s attack. There doesn’t seem to be an exact science to how the referee decides when the fight is over as there are no accumulated points or time limits for each fight. The Daily Mail stated that the fight often ends when one of the slappers refuses to continue. The referee also appears to use their better judgment to determine whether it is medically permissible for a slapper to receive more blows. According to VICE‘s detailed breakdown of Dumpling’s journey to win first place, which included a cash prize of 30,000 Russian Ruble (or the equivalent of $470 US dollars), the road to the champion title might not have been as painful to him as it was for his rivals. During his last fight of the tournament, Kamotskiy’s opponent took two furious blows which visibly almost knocked him to the ground. By comparison, Kamotskiy’s face barely moved as he received counter slaps. In the end, Kamotskiy was pronounced the winner. It is unclear how many other contenders the champ had to smack down during the tournament. Based off of the footage that captured several of Kamotskiy’s duels, it seemed as though the Russian Dumpling had to slap at least four other slappers to get to the final round. While video footage of the slapping competition has been cut and gif-ed in a hundred ways to emphasize the top highlights from the tournament, a full video — which runs almost 17 minutes long — of the new competition features a number of slapping contenders and visitor reactions. Some of the contenders are rather eccentric, with one of them arriving a Captain America long-sleeved shirt and a backward baseball cap. Some of the eccentric characters competing in Russia’s slapping competition. The official SPS website described the event as the largest sports, beauty, and healthy lifestyle festival in Siberia. More than 2,000 athletes traveled from across Russia and Europe to the two-day event. In addition to the slapping competition, SPS visitors also enjoyed seminars around the theme of healthy living and beauty and master classes in various areas of fitness. The event was also child-friendly with a “children’s room” equipped with an animator. Next up, peep these photos of Soviet youths in the 1960s that might surprise you. Then, discover 32 facts about Russia that you probably didn’t know.